Assistant Referee Paul Scott is retiring from his role with the Professional Referee Organization after accepting a new opportunity with CONCACAF, where he will become Manager of Refereeing. Scott’s career as an official in Major League Soccer will come to a close at the end of this month, two decades after it started, but he can still remember his first MLS appearance with the flag. “I do recall the inaugural match at the Cotton Bowl, with the Dallas Burn,” Scott told proreferees.com. “I lived in Ft. Worth at the time and it was an all-local crew with Kevin Terry Sr. as the referee. It was a spectacular event, walking out in procession to the cheers, flags; among some of the biggest names in soccer at the time. “It gave me butterflies. Everyone was so excited for the birth of this league and the possibilities therein. “Having done so many games over so many years, I don’t recall all the details. However, I do remember afterwards feeling that I had just done a million sprints – my quads burned. That game was in 1996, but Scott’s officiating journey began long before. Twenty years prior to that match, he was refereeing locally to earn a few extra dollars, but soon realised that there was an opportunity to make a career out of the game. “There were some very good referees and assessors in Tulsa. Among them were Peter Aradi, Russ Straurovsky, Richard Brook, Atef Iskandar, and Bill Schofield, who were my role models and teachers. “While in college I began to do indoor games and was fortunate to attend a clinic put on by Manny Ortiz Sr. from the Dallas area. He made me really think that officiating was something that I could take to a high level but I knew that I needed to be in a hot bed of soccer, so after college I got a job in Ft. Worth. Since then, there have been plenty of changes afoot in MLS. The status of the league has continued to grow over recent years on the playing side, but Scott also believes the introduction of PRO has aided the development of soccer in North America. “The players have improved leaps and bounds since that first season. The technical and tactical abilities are on another level, as are the coaches. “Given the growth of the game finally in this country, it’s not inconceivable that in another 20 years the league could be challenging the NFL for ‘America’s Game’. “The creation of PRO has been hands down the best move for the development of referees that service the professional game. “We have two fitness coaches, a nutritionist, video resources, and the experience of Peter Walton, Paul Rejer, Michael Kennedy, and Brian Hall to help us continually raise the bar. “Each area and need of the professional referee is being addressed so that the men and women who do these games can be successful. “As for my progression and what I’ve learned? Well, I feel that I now know what it means to be a professional on and off the field. That the PRO badge is a burden of responsibility to be a role model, to be on your game at all times. “Others want to wear that badge and measure themselves against those of us in PRO. As such, it’s important to show them how to be confident, not arrogant; prepared; to be approachable; a mentor to our fellow referees striving to climb the ladder. The official looks back fondly on 2013, when he ran the line in the MLS All-Star game, and was assigned to the MLS Cup Final, alongside Chico Grajeda and Bill Dittmar, who have become a close-knit trio over the years. “I had only worked with Chico once, years prior, when he was a fourth on a Columbus game. As for Bill, I had no clue who he was. So in our own way each of us were a bit disappointed that we were not placed with the referees we had requested. “Now, not only is there no-one else we’d rather work with as a team, but off the field we have grown as close as brothers. We have a friendship that will continue long after we’ve retired from this game that we love. “Another highlight was being on David Beckham’s first game with the Galaxy, versus Chelsea. I was AR1 and there was a mob of reporters along the sideline. After being named Assistant Referee of the Year in 2014, Scott feels the time is right to bow out and is excited about his new role with CONCACAF, which he started last month. “These previous two seasons have been spectacular to be sure,” Scott, who has officiated 10 MLS games this year, added. “All good things come to an end. I know my career is in the twilight – the best an athlete can hope for is to retire on their own terms. “Working for CONCACAF is a terrific opportunity, these jobs do not become available with any frequency. I consider myself very fortunate to have landed such a position, it’s beyond my wildest expectations. “I had my farewell game in Kansas City so that my family could attend. Without their support over these 20 years, all of this would not have been possible. 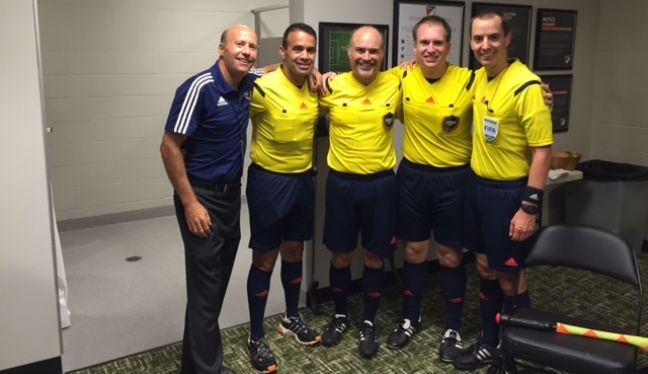 “I’m just a ref who did my job, to be prepared for each match to the best of my abilities. Off the field, my only goal was to be a role model to the newer referees to live what it means to be a professional.